– Divided we stagger – Can Indonesia heal the deepening rifts in South-East Asia? FOR decades the Association of South-East Asian Nations (ASEAN) has led a largely blameless existence, untroubled by the glare of publicity as it gently sought to bring coherence to a region of enormous political and economic differences. Not for ASEAN the highs and calamitous lows of, for example, the European Union. All that has now suddenly changed. On its 45th birthday newspapers and blogs are at last paying ASEAN plenty of attention, though marked more by despair than praise. Some even question its very survival. The cause of the furore is the widening division in the ten-member grouping over China’s maritime claims in the South China Sea. The division was laid bare publicly at a meeting last month of ASEAN foreign ministers in the Cambodian capital, Phnom Penh. For the first time in its history ASEAN failed to issue a joint communiqué. Its members could not agree on what to say about China. Broadly, those members with claims in the South China Sea themselves—Vietnam, the Philippines, Malaysia and Brunei, supported by Singapore and Thailand—want ASEAN to register serious concerns over what they see as China’s belligerent actions to enforce its claims in the waters of the South China Sea and over the Spratly, Paracel and other islands and atolls. However, non-claimants, mainly Cambodia supported by Laos and perhaps Myanmar, are loth to alienate China. They go along with China’s insistence on dealing with the issue with each country in turn. This year Cambodia holds the rotating chair of ASEAN. Right after the Phnom Penh fiasco, Indonesia’s foreign minister, Marty Natalegawa, in a vigorous exercise in diplomacy, tried hard to paper over the cracks. Since then, however, there has been no let-up in the unASEAN-like public rowing. Last week the Philippine government sent the Cambodian ambassador packing. He had accused the Philippines and Vietnam of playing “dirty politics” in their push to put the South China Sea on ASEAN’s agenda. The regional press is full of articles and letters lambasting Cambodia’s stance. ASEAN members had hoped to get through this crisis by establishing a “code of conduct” for the South China Sea, yet China refuses to discuss this idea until, it says, “conditions are ripe”. Meanwhile, a mood of gloom pervades preparations for the next full ASEAN summit, due in November. This time round, the countries should be able to agree on a common position for public consumption, avoiding another unseemly row. But that still leaves plenty of scope for private grief. In particular, some diplomats wonder whether Cambodia is now irretrievably in the pocket of China. If so, it would be an end to the famous “ASEAN consensus” by which the organisation makes decisions. Cambodia relies more than most in the region on Chinese investment and other blandishments. It is now expected to do Beijing’s bidding. A Cambodian diplomat says that even his government was surprised by how fast and strongly China pressed it to defend its position at the failed summit. Tiny Laos also depends heavily on Chinese money and goodwill, as does Myanmar. 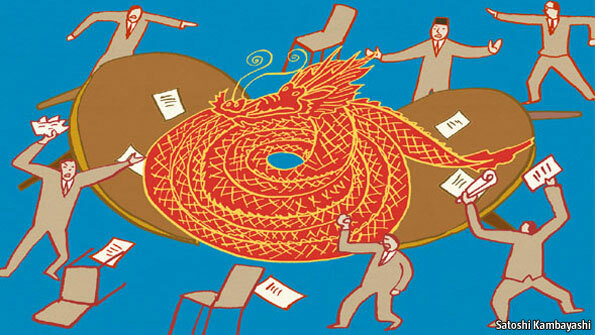 China, as one writer puts it, may have obtained an “outsider’s veto” over ASEAN when its interests are threatened. The grouping could thus become a victim of a new era of great-power rivalry in the region. Until recently it had been making steady progress in establishing itself as the main forum for pan-Asian dialogue and discussion, hosting the East Asian Summit, for instance, among many other talking shops. Yet now it seems to be caught between a rising China on the one hand and a freshly engaged America, seeking to balance against China, on the other. In particular, the Philippines and Vietnam now look openly to America for military and diplomatic support as they face up to an assertive China in their sea of troubles. Though Cambodia and Laos have lined up with China, and Myanmar may yet go the same way, Thailand and the Philippines are treaty allies of America, which is also revving up its military engagement with Singapore. The fear is that these allegiances will trump the more abstract attractions of ASEAN, together with its attempts to forge any closer union. The most obvious potential casualty will be the push to create a European-style single market, the ASEAN Economic Community (AEC), scheduled to come into effect in just three years’ time. Ian Storey of Singapore’s Institute for South-East Asian Studies points out that of the 132 paragraphs of the unpublished Phnom Penh communiqué only four concerned the wrangle over China’s territorial claims. Many of the rest were about economic and commercial integration. All those have now been lost. It is even less likely that the AEC will start on time, let alone be effective. The wider ASEAN agenda is sinking into the South China Sea. Posted by The Aseanists Time, Unmask The Truth on August 17, 2012 in The Aseanists Time and tagged ASEAN, Cambodia, China, Indonesia, Philippine, Phnom Penh, South China Sea, Southeast Asia.